Many patients initially diagnosed with ADEM develop clinically definite MS upon long-term follow-up. Pathological hallmark of ADEM is perivenular inflammation with limited "sleeves of demyelination"
Vaccination for measles, mumps, or rubella. 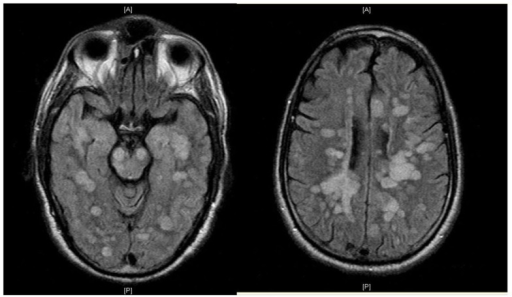 MRI scan:large symmetrical lesions with basal ganglia and thalamus involved. Brain biopsy: consistent with demyelination.